Secondary Side Constant Voltage and Constant Current Control. 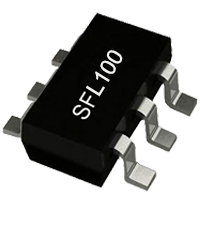 SFL100 is a highly integrated solution for SMPS applications requiring a dual control loop to perform CV (constant Voltage) and CC (constant current) regulation. SFL100 has wide VCC operating range (3.3V to 36V ). The IC integrates a 1.2V voltage reference with ±1% accuracy, two Op-Amps (with OR-d open drain output), and a low side current sensing circuit. The voltage reference, along with one Op-Amp, is the core of the voltage control loop; the current sensing circuit and the other Op-Amp make up the current control loop.